National American Eagle Day is observed each year on June 20th. This day is celebrated in honor of our national symbol, to raise awareness for protecting the bald eagle, to assist in the recovery of their habitat, and to educate Americans on their significance. The bald eagle can be sighted during its breeding season at nearly any wetland habitat such as seacoasts, rivers, large lakes, or marshes. You can find these eagles around large bodies of open water with an abundance of fish. In the mid 20th century, America’s precious eagles were almost lost due to the effects of habitat destruction, poaching, and environmental negligence, specifically the contamination of food sources by the pesticide DDT. Thanks to conservation efforts of various organizations, conservationists, and protection laws – the bald eagle populations recovered. Habitats restored through CWPPRA projects aided in the delisting of our national symbol from the endangered species list in 2007. CWPPRA has protected, created, or restored approximately 97,177 acres of Louisiana’s vanishing coastal wetlands in its first 25 years. 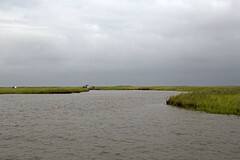 Those restored swamps, marshes, barrier islands/headlands, and associated open-water habitats provide foraging, nesting, breeding, wintering, escape cover, and nursery habitat for wildlife, in particular the American bald eagle.